It get's 4 stars because, well what would you expect, the slide rule is accurate to 2 decimal places. And it could have given you 3. Oh well. If you are using your watch to calculate your arrival time you probably don't really care if you are off by a few minutes. Downside, if you do not have perfect vision, you'll have a hard time reading the sliderule. Don't even think about doing this while you are driving. My eyes are fine with it in good light. On the other hand, the time hands and numerals are plenty large enough and easy to read. The luminescent marks seem to stay bright for about an hour, which is good enough for us casual night hawks. Otherwise you need a watch that has tritium and who knows whether that will pass airport security these days. One other thing is that the 24 hr inner hand can be easily obscured by the main watch hands. So this feature not very handy as a second timezone clock. It will help you remember the military time, but at say 11:00 you can't see the underlying hand. Not a big thing, and I suppose if you set to say 8 or 9 hours difference it might be more visible. I just love the looks of it. GMT/world watch works nicely for frequent travellers. As for the slide rule... again, I mainly like the way it looks and the 45 degree angled control knob. As far as functionality goes, don't expect too much. The scales are tiny, even if have 20/20 vision you would have hard time reading them in dim light. My only hesitation before buying this watch was the relatively large dial diameter (43mm), but it is not as bad as I thought. Easily 5 stars, esp. considering the price. The Nighthawk glass face is perfectly flat, this goes nicly with the overall concept of the watch. It'll take some getting used to, moving the date forward on Februaries and 30 day months, but I still like it much better than the Seiko. Lots of features: attractive, awesome looking, never needs battery, waterproof to 200 metre. If you are a big person with a big wrist this watch is for you. Not for an Asian wrist like me. I have the stainless belt adjusted down to the last pin, it bearly fits my wrist and it still fell lose, but i like it. This is simply one of the most beautiful watches I have owned. The attention to detail and finish are top-notch. I have many higher dollar watches, and aesthetically, this tops most of them. I agree, a stopwatch would be a nice addition. I don't know where you would put it. It is massive, but I am too, so I wanted it to be. Some reviewers called it "heavy" but I don't find it particularly so. I'm not giving it five stars because the band feels cheap. It isn't going to break, that's clear. It isn't going to fall off either, with the clasp lock. Ok, so i'm not one of those watch enthusiasts or anything... But I can tell you that I did A LOT of research before purchasing this watch 6 months ago and it has met or exceeded all of my expectations. I like the weight of the watch, not too heavy but you know its there, weight is sign of reliability in my mind.. I have yet to use the circular slide rule in a real-life situation but i like knowing that I can take the square root of a number or convert units anytime i want.. If you're looking for a good looking watch with simple, attractive design and a little functionality this is the watch for you. As a collector of watches I rate the Nighthawk as an impressive one that I am pleased to own and can wear in any situation. 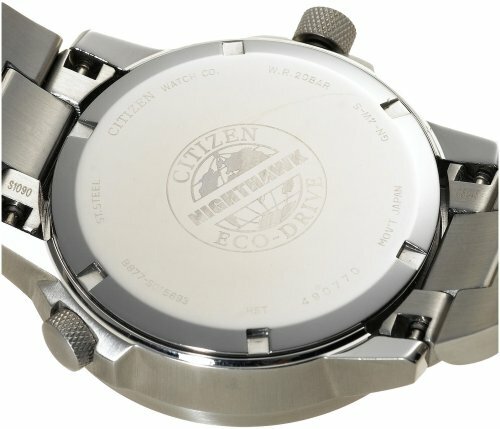 The Citizen Nighthawk is a nice looking watch with some nice features. I think it's a very good value for the money. The face is a good size and it looks good for either dress or casual. Some reviews state that it's heavy but I don't find it to be too heavy. My other watch is a Seiko automatic which is heavier so perhaps compared to a regular quartz watch this one may be heavy. In my opinion, here are some of the pros and cons. - large face, good look for either dress or casual. - slide rule if you want it. - you can adjust only the hour hand if you want. Very nice feature if you travel frequently. - bracelet feels pretty cheap. I would have given it five stars except for this. - No day of week. I knew that before I bought it but it's a feature I miss on this watch. Will the battery last forever? we'll wait and see.